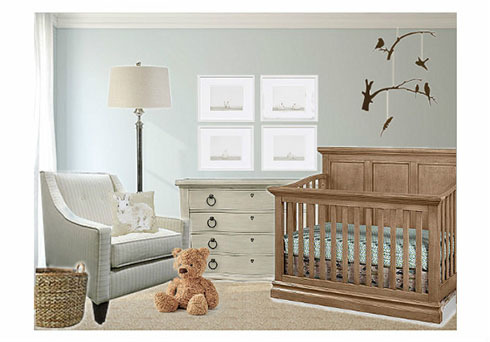 We spotted this handsome crib in a beautiful cashew finish in our Clearance Center. For this nursery design we combined pieces that coordinate without necessarily matching to create an eclectic look. We paired the crib with this pretty vintage inspired drawer chest by Lexington Furniture. Every nursery needs seating for mom and dad! We added this pretty pin stripe arm chair from Rowe which not only makes a design statement but adds a comfortable place to rest or read. This year's 2017 Color Trends include pale hues for nurseries with accents of soft turquoise, terracotta, grey, beige, or muted olive. The addition of nature inspired motifs will also be popular this year. Consider a botanical or animal print wall mural as a backdrop. If you are crafty, you might even add your own personal touches with handmade paper ornaments - it's a playful trend not to miss! We hope you are inspired and look forward to seeing you at our Clearance Center and Warehouse at 22250 Shaw Road, Sterling VA 20166. Our Clearance Center is re-stocked daily – items are first come, first save! Visit us often because you’ll never know what you’ll find.